Several genetically altered signaling pathways have been profiled in NSCLC, enabling advanced management of NSCLC using targeted therapies. This study investigated the therapeutic spectrum of NSCLC with uncommon molecular alterations by allocating patients to treatment arms based on molecular aberrations; targeted therapies alpelisib (PI3Kαi), capmatinib (METi), ceritinib (ALKi), and binimetinib (MEKi) were evaluated. The study was based on the umbrella design. Key objectives: investigate feasibility of using one trial for different agents based on biomarker-integrated analysis, assess anti-tumor activity, characterize safety, tolerability and PK profiles of individual agents. Key eligibility criteria: age ≥18 years; ECOG PS ≤2; failed prior treatment/unsuitable for chemotherapy. Documentation of locally determined molecular alterations before treatment allocation was required (alpelisib, 350 mg QD: PIK3CA mutation/amplification; capmatinib, 400 mg BID (tablet): MET IHC overexpression/amplification; ceritinib, 750 mg QD: ALK or ROS1 rearrangement; binimetinib, 45 mg BID: KRAS, NRAS or BRAF mutation). 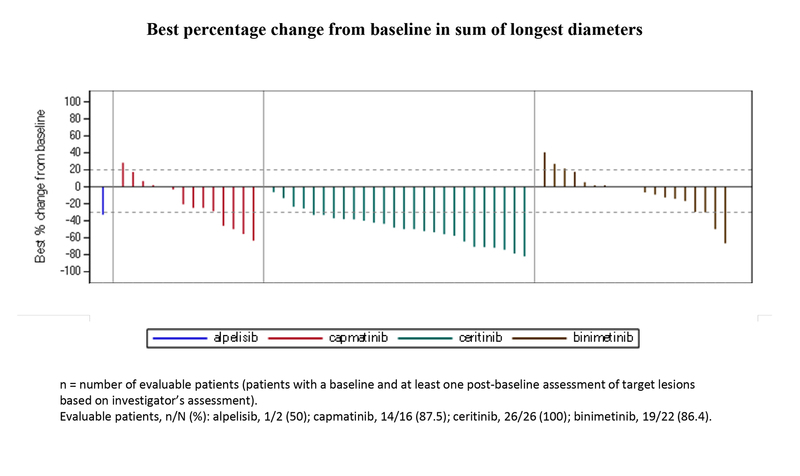 Sixty-six patients with advNSCLC were enrolled (median age 58 years; 65.2% male: alpelisib, n=2; capmatinib, n=16; ceritinib, n=26; binimetinib, n=22). As of Feb 28, 2018, 10 patients in ceritinib and 2 in binimetinib arms were ongoing. Twenty-four patients had confirmed partial responses (36.4%): alpelisib, 0%; capmatinib, 18.8%; ceritinib, 73.1%; binimetinib, 9.1% (Figure). Longest mPFS (14.4 months) was in ceritinib arm. Among the most common treatment-related AEs: alpelisib: malaise, hyperglycemia, dysgeusia; capmatinib: nausea, anemia, peripheral edema, decreased appetite; ceritinib: diarrhea, vomiting, ALT/AST elevation; binimetinib: mouth ulceration, AST, blood CPK increased, rash. Most AEs were grade 1/2.